Transparent container lets you easily see when it's time for a refill. Fill it with the soap color of your choice to accent any color in your kitchen, bath or both. EASILY PUMPS HAND SOAP, DISH SOAP, LOTION OR OTHER LIQUIDS - The pump primes quickly and can easily pump regular hand soap, lotion or other liquids. Brass head and ABS plastic Pump is Durable and Environmental. 320ml container. Easy-push, self-priming soap dispenser, brush nickel. Spout is ideal for dispensing onto sponge or directly into sink. Durable, lead free brass head with a transparent PET plastic soap reservoir. Refillable from the counter top (Pull-out removable pump-head to fill). 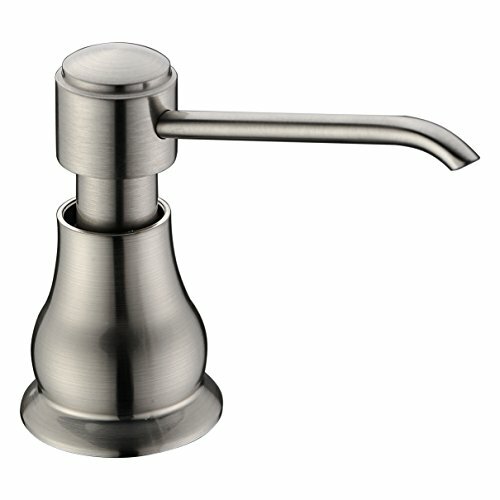 Brushed Nickel finish, Beautiful and generous appearance. Conform to the installation requirements of North America. If you have any questions about this product by Delle Rosa, contact us by completing and submitting the form below. If you are looking for a specif part number, please include it with your message.